Although the Devon Horse Show and Country Fair is now the oldest and largest outdoor multi-breed horse show in the country, it started with much more humble beginnings. In the 1890’s there was a new migration into the rolling rich farmlands and small towns of the Philadelphia western suburbs. The railroad lines attracted development to the newly christened “Main Line” area. Although families arrived to the Main Line by train, once settled they used horses as their primary form of transportation. Horse-drawn vehicles were used to go to church, to town, and to the market. 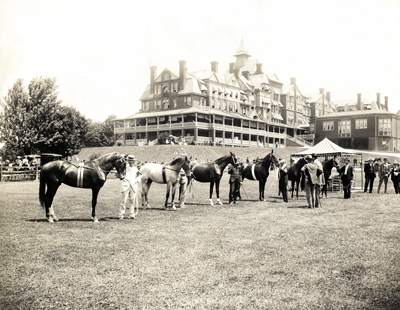 On May 22, 1896 a meeting was called by the gentlemen of the Main Line area inviting their friends and neighbors to “effect an organization for the purpose of holding a Horse Show at Devon.” Less than two months later the first Devon Horse Show was held! The first show was a one-day event that consisted of approximately thirty classes. At most, each class had ten entries. The fenced-in show ring was constructed on grass and the judges and officials sat in a gazebo in the center of the ring. Before long, the show was expanding in response to overwhelming demand. By 1914 show had become the largest outdoor horse show in the entire country. A grandstand was erected for the comfort of the spectators. Even more luxurious were the famed box seats covered by a canvas awning. The elite could now watch the show in complete comfort. The show was nearly cancelled in 1918, due to the First World War. Instead the decision was made to hold a scaled-down version of the show as a charity fundraiser for the war efforts. The three-day show raised in excess of $9000 in donations. To this day, the charitable focus of the show distinguishes the Devon Horse Show from other events. 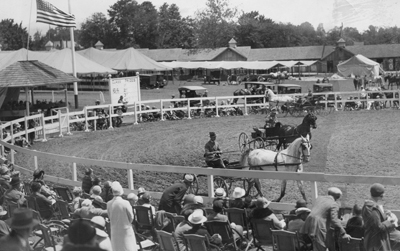 The Devon Horse Show took a new direction in 1919 when it was decided a Country Fair should be held in conjunction with the horse show. It was then that Bryn Mawr Hospital was selected as the show’s charitable beneficiary. Some traditions from this early Country Fair, such as tea sandwiches, remain a part of the show today. At this time in history, women were gaining their rights all over the country. By organizing and running the Country Fair, the women of the Main Line proved their strength and organizational skills. This successful fundraiser resulted in a $26,000 donation in its first year. Since that time, the Country Fair has donated in excess of $15 million to the hospital. As the show grew, so did its facilities. With hundreds of competitors now flocking to the Main Line to compete, there was a need for permanent stabling to house the horses. The first barn was built by William DuPont for his own horses. Other exhibitors were encouraged to build barns of the same style. By the end of the 1920s the Eastern side of the grounds was completely lined with stalls. By 1938 Devon was able to provide stabling for 600 horses. By its twentieth anniversary the following year, the show it had become truly national in scope. Competitors arrived from as far as California and classes were expanded to include competitors of all ages. The Second World War unfortunately resulted in a cancellation of the show between 1943 and 1945, although the dates for the show were reserved so it could be revived once the war was over. The show resumed, right on schedule, in 1946. In the 1950s, in an effort to expand the appeal of the show, attractions were added to the Country Fair. A midway was added — complete with the now iconic Ferris wheel. The shopping and food choices were also expanded. The Budweiser Clydesdales made their first appearance at the show. The barns and grandstands were renovated and enlarged. Today the Devon Horse Show is internationally recognized as one of the premier equestrian events in the country. Although it draws top competitors from around the world, the show continues to reflect the local traditions and lifestyles of the Main Line. Over 2000 volunteers work to make the show a success and to raise money for Bryn Mawr Hospital. From humble beginnings, Devon is again and again reborn anew with each passing generation.